3 tablespoons Unsalted butter sticks, 8 oz. Melt butter in a large skillet over high heat. Add pineapple, sugar, and oats; cook, stirring and scraping bottom of pan, 5 minutes. 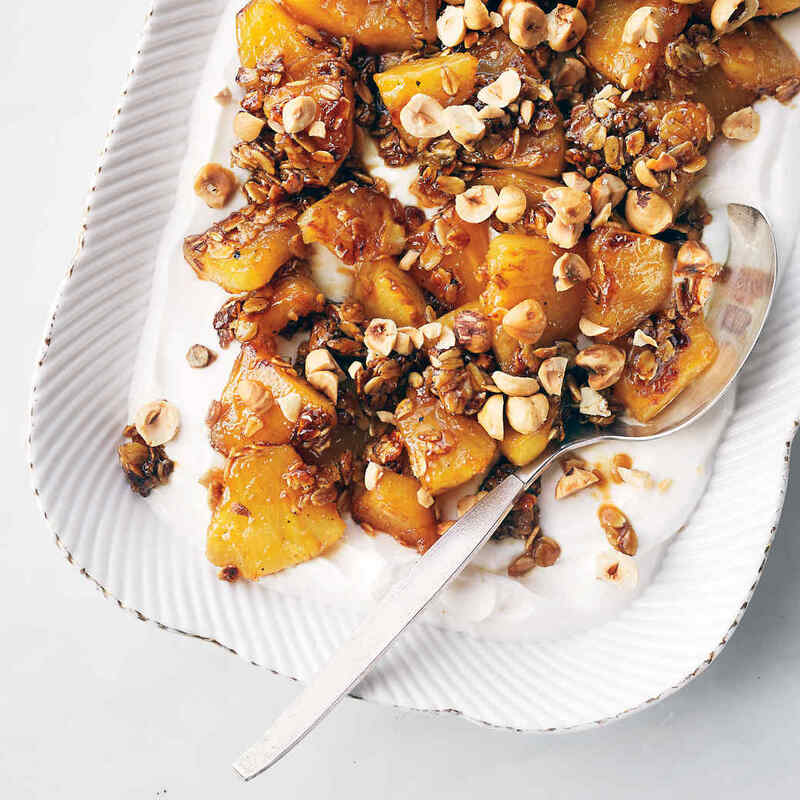 Reduce heat to medium-high; cook, stirring, until sugar is caramelized and pineapple softens, about 5 minutes more. Stir in lime juice. Spread mixture in a single layer on a rimmed baking sheet, breaking up any big chunks; let cool slightly. Spread yogurt in a large dish. Top with pineapple mixture and hazelnuts. Serve immediately. Season chicken with salt and pepper. Heat oil in a large skillet over medium-high heat. Cook chicken, stirring occasionally, until opaque and golden brown in places, about 3 minutes. Add garlic and ginger, stir, and cook until fragrant, about 30 seconds. 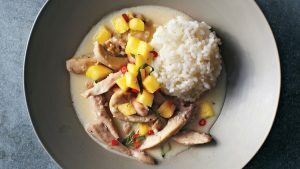 Add fish sauce, coconut milk, and 1/2 cup pineapple; bring to a boil. Stir, reduce heat to low, and partially cover. Simmer until chicken is cooked through, about 8 minutes. Divide chicken and sauce among serving bowls. Stir together remaining pineapple, scallions, and chile in a bowl. Serve chicken with sticky rice and pineapple salsa. Preheat oven to 350 degrees with rack in lowest position. Score ham with a sharp knife in a pattern of 1 1/4-inch diamonds. Press a clove into the center of each diamond. 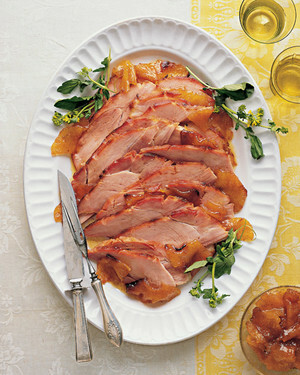 Place ham, cut side down, in a roasting pan; drizzle wine over top. Coat ham with half the glaze. Cover with parchment, then foil, and bake for 1 hour. Remove from oven. On a lightly floured surface, roll each disk of crostata dough into a 9-by-12-inch rectangle, 1/8 inch thick. Place 1 rectangle on a parchment-lined baking sheet, and freeze until firm, about 30 minutes. Fit the other rectangle into an 8-by-11-inch fluted rectangular tart pan with a removable bottom. Trim dough flush with top edge of pan. Refrigerate until ready to use. 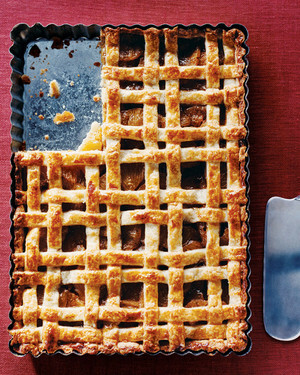 Make the lattice: Remove baking sheet from freezer. Using a clean ruler as a guide, cut dough rectangle into eighteen 1/2-inch-wide strips using a sharp knife or a fluted pastry wheel. Lay 9 strips of dough on another baking sheet in pairs of parallel lines that extend slightly past the length of the tart pan. Starting in the center, weave 1 new strip under and over the strips on the baking sheet. Weave a second strip inch away, this time weaving over then under. Repeat, weaving pairs of strips across half of the tart, spacing pairs 1 inch apart. (If dough strips become too soft, return to freezer until firm.) Return to center, and repeat with remaining dough strips to form a lattice pattern. Freeze until ready to use. Cut each pineapple quarter crosswise into 1/3-inch-thick slices. Combine sugars, vanilla seeds and pod, and lemon juice in a large saute pan. Add pineapple, and cook over medium heat, stirring until sugars dissolve and mixture becomes saucy, about 3 minutes. Add rum, and simmer until pineapple has softened and almost all of the liquid has evaporated, about 20 minutes. Remove from heat, and let cool in pan. Discard vanilla pod. Remove tart pan from refrigerator. Spread pineapple mixture evenly on dough. Combine yolk and cream in a small bowl, and brush some along top edges of tart. 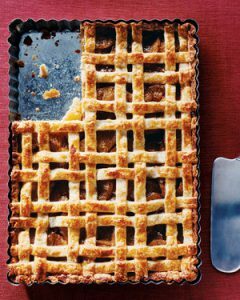 Carefully slide frozen lattice onto tart, centering it over filling, and press edges to seal. Trim excess dough. Brush top of lattice with egg wash. Refrigerate, uncovered, until firm, about 1 hour. Preheat oven to 400 degrees. Bake tart for 15 minutes. Reduce heat to 375 degrees, and continue baking until crust is golden and filling is bubbling, 40 to 45 minutes. (If crust browns too quickly, tent edges with foil.) Let cool in tart pan on a wire rack. Unmold, and serve immediately. Make the honey syrup: In a small saucepan, combine the honey with the water and bring to a boil. Reduce the heat to medium and simmer the syrup for 5 minutes. Remove from the heat and let cool completely. Make the cocktail: In a cocktail shaker filled with ice, combine the gin with the lime and pineapple juices and honey syrup. Cover, shake vigorously, then strain into a chilled coupe. Top with prosecco and garnish with rosemary to serve. Want some extra tips for slicing and dicing your perfect pineapple to create these mouth-watering recipes? Check out our easy how-to here! 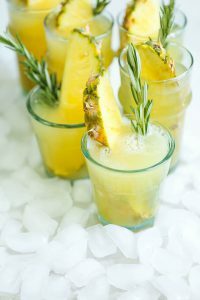 This entry was posted in Featured, Latest News, Recipes, Tips & Tall Tales and tagged fall, fall pineapple recipes, health benefits, healthy, how to cut a pineapple, pineapple, pineapple recipe. Bookmark the permalink.